This month the lovely Becca from Keeping up with the Joneses has agreed to share her great tips on bringing up baby. How old is your little one? How has motherhood changed you? I terrified of having children right up until the point that little E was first placed in my arms, then everything changed in a matter of seconds. I felt this overwhelming urge to look after and protect this tiny little person which I still feel to this day. 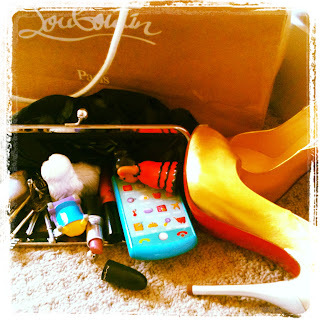 What items are in your handbag (baby related)? I usually carry around a spare of her toy bunny, Doudou. Leaving Doudou at home can prove disastrous. I also can’t live without my iphone, E’s entire life in photos is stored on my phone. Our camera was stolen from the hospital just after little E was born so I am paranoid about backing up all my photos, my iphone does this automatically for me. My phone is also loaded with baby apps which are essential for keeping E entertained when we travel, Peekaboo fridge is her current favourite. What things could you not live without? I really could not manage without the help and support I receive from my family, especially my mother who looks after little E whilst I work part time. As for baby items, that would have to be my Beaba baby cook. When little E first started on solids I would use it to steam and blend everything. I still use it to steam her veggies and defrost anything I’ve made beforehand. Any good advice you received (or could give)? As a mother of a young baby, everyone feels the need to impart their advice (and opinions) on you which can feel a little overwhelming especially as an exhausted and often sleep deprived new mama. Remember that as a mother you know your child better than ANYONE and always trust your instincts. Do you use any good books or websites that you’d like to share to help you?